Like everyone is at this time of year we've been super busy lately, particularly as we've had two sets of visitors, two weekends in a row. The festive season means we have had extra options for our guests to enjoy, namely the Street of Light in George Street and the Christmas Market, but this weekend after our last set of guests had left we took the chance to view Edinburgh and the Christmas hustle and bustle from a different angle. We decided to climb the Scott Monument in Princes Street Gardens, something I have to say I never knew you could even do until recently. In case you didn't know the monument was built to honour the Scottish author Sir Walter Scott, it was built in the Victorian Gothic style and really stands out as an imposing sight on Princes Street. It's apparently the largest monument to a writer in the world. When Scott died in 1832 a competition was held to design a memorial to him. The winning design was that of George Meikle Kemp, who on his death, sadly by drowning before the completion of his monument, was buried in St Cuthbert's churchyard (well worth a visit too). The monument itself features many characters from Scott's novels sculpted by a variety of Scottish sculptors. The monument was completed and inaugurated in 1846, as I mentioned sadly after the death of its designer. The tower is just over 200 feet tall and as I said I recently discovered visitors can go right up to the top via some very narrow spiral staircases with 287 steps in total. Fortunately with different platforms and viewing levels for a break from climbing or if you don't feel you want to climb any higher. Of course this means you get some great views of Edinburgh and we weren't disappointed on our visit as the weather was just perfect. We even managed to spot the area of Edinburgh that we live in. We got the added bonus by visiting now of getting to see the Christmas market and some of the fairground rides from an elevated perspective. If nothing else it confirmed to me that I did not fancy doing the ride right besides the monument! 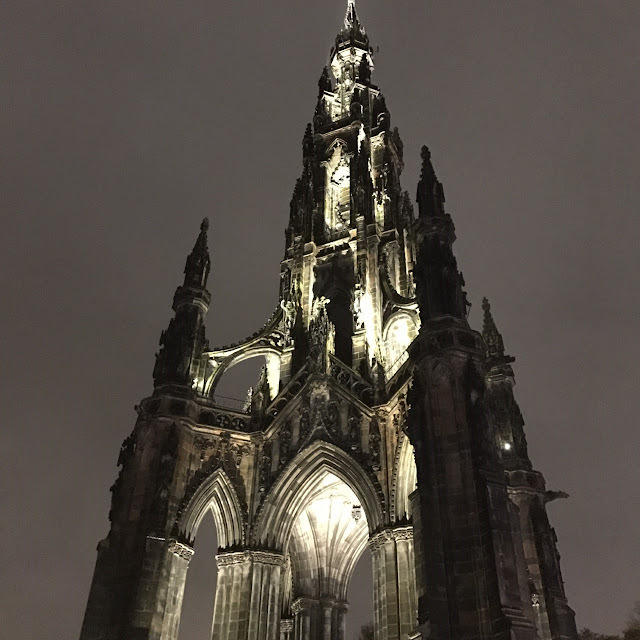 If you want some different views across Edinburgh and beyond (or at the moment an alternative activity at the Christmas market) the monument will certainly give it to you. Well worth the climb particularly if you are lucky enough to go on a clear, beautiful day.